It was not too long ago, in September, when Turkish Foreign Minister Ahmet Davutoğlu announced that following Jerusalem's adamant refusal to apologize over the 2010 Gaza flotilla raid, Ankara will be downgrading its diplomatic relations with Israel and suspending key military agreements. In a dramatic turn of events, Turkey announced that it was expelling Israeli Ambassador Gabby Levy from Ankara. 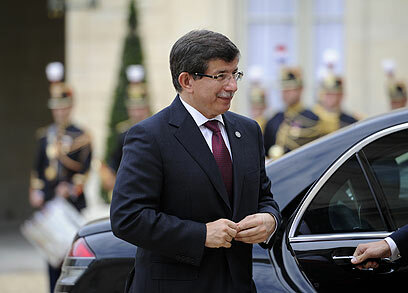 Davutoglu said Turkey's diplomatic representation in Israel would be further reduced to second-secretary level. In accordance, all lower Israeli diplomatic personnel above the second-secretary level have also been expelled. The announcement followed a press conference, in which Davutoglu said that some of the UN's Palmer Report findings on the raid were "unacceptable," adding that it was "time for Israel to pay the price... The highest price it can pay is losing our friendship." Following the expulsion of Levy, the Turks announced that no Israeli diplomats above the second-level secretary will be allowed to remain in Ankara. This led Jerusalem officials to search for the most viable candidate meeting Ankara's criteria – offering the position to Joseph Levy-Safri. Safri, 39, a conflict resolution attorney, enjoys high esteem in diplomatic circles and most recently he has served as part of Israel's mission to Uruguay. Turkey withdrew its own ambassador to Israel immediately after the 2010 raid. At the time, Turkey vowed that its demand for an apology from Israel would remain unchanged, stating that it is powerful enough to protect the rights of its citizen. The Palmer Report did not demand an Israeli apology, establishing instead that Israel should express regret and pay reparations, the official said in September, adding that Jerusalem still hoped that the two countries could "return to the cooperation that was a cornerstone of regional stability." Another senior official added that "the severing of ties goes against Turkey's strategic interests." Since then, the Turkish prime minister's rhetoric has taken a belligerent tone, threatening that Ankara's warships could deploy in east Mediterranean waters at a moment's notice, and outfitting Turkish warplanes with radar systems that identify Israeli targets as "hostile." A couple of weeks after the expulsion of Levy, Israel decided to end its police cooperation with Turkey, transferring the police attaché stationed in Ankara to Romania. Ministry Spokesman Tal Volovitch had said that Internal Security Minister Yitzhak Aharonovitch has decided to transfer Israel's Ankara-based homeland security representative to Bucharest. See all talkbacks "Israel boosts diplomatic mission to Turkey"